I've got a short article in the March issue of Fresh Cup magazine. It's not available online, but for those of you in the coffee industry, you should be reading Fresh Cup anyway! It's for the "Roaster's Realm" column, and I wrote about roasting quality coffee at origin. Often you can't get very well-roasted coffee in producing countries. There's some striking irony when you are surrounded by lovely, green, growing coffee trees and drinking a cup of something that's diner quality at best. But things are changing. I interviewed three quality-oriented roasters I have worked with in three different countries (Guatemala, El Salvador, and Puerto Rico), and came up with some interesting results. Check it out. I went on and on about pacamara coffee yesterday, and included some links to places you can buy some. One of those places was Plowshares Coffee in New York State. Plowshares_@CoffeeScholar I sold out of Pacamara for the year just before you posted this! Thanks for the shoutout anyway. btw it was delish. I can vouch for the delish-ness. I had some of this coffee back in — July, I think? — and it was a classic pacamara, and expertly-roasted. Anyway, if you are looking for pacamaras, don't go to Plowshares. But, ironically, that's a good sign that if you are looking for good coffee, you should go to Plowshares. Anybody who has perfect coffee from every world origin in stock at all times of the year is either lying to you or clairvoyant. Either they are selling you old-crop coffee, or they somehow, magically, sold out of the last bean of one year's coffee on the same day they received their shipment of the next year's coffee. I'm sure Anthony doesn't enjoy running out of a great coffee like his pacamara. But the very fact he did is a good sign that you should feel good about buying whatever else he has on the shelf. And try the pacamara next year! They usually hit the shores of North America right around June 1st. For more way-too-in-depth coffee talk, follow me on Twitter, or be my friend on Facebook. One. The Actual Show. Lots of great coffee and interesting products on the show floor again this year. There was an understandable skewing toward Northwest companies, like Caffé Vita, Synesso, and the honorary Northwesterners, La Marzocco USA. The best cup of brewed coffee I had all weekend (though not the Coffee of the Week... I'll get to that in another post), came from the Hario booth, where I got a perfect pour-over cup of Intelligentsia's fresh crop Kenya. Thanks to Bronwen for taking me by the hand and guiding me to the Hario booth when I was jonesing on Friday morning. (Hario also wins best business cards for their flaming hot pink numbers). The funnest little activity at the show was the Aroma Challenge where you had to take a quiz on matching Le Nez du Café vials of essential aromas to a list of aromas. Very tough! I got 10 out of 16, though as soon as I turned in my sheet I realized I had misidentified the most obvious one (potato!) and should have got 11 right. Anyway, it was a fun challenge. 2. The Northwest Regional Barista Competition. I didn't actually see even 2 minutes of this thing, though I hear it was fantastic as always. Northwest barista legend Billy Wilson took the gold. You can read about it on coffeed. 3. Party Madness. Lots of fun at the party at Visions Espresso on Friday night, where baristas played with their array of different espresso machines while the wine and cheese flowed. Coffee people are the most fun people there are to have parties with, I've decided. They get really wired on coffee, then they start drinking. Sarah Allen also led an expeditionary party up the hill from downtown to Linda's, which is actually my old stomping grounds (those many years ago), where we took over an entire banquette outside and drank Tecate and argued about coffee. On Saturday night it was thee Latte Art competition between Seattle and LA hosted by Victrola. Even more people at this one. Got to see lots of great friends. The LA folks took the competition pretty handily, to Seattle's undying shame. But a good time was had by all. Victrola really has the perfect location and space for parties of this kind (fire marshall regulations aside... it got a little too full at one point). 4. Cupping at Coffee Enhancement Lounge. Sunday it was back down to Visions for a wonderful, peaceful, clean cupping of those pacamara coffees I have been talking about lately. It was the perfect way to wrap up the weekend. The CEL has great natural lighting... the sun was shining in through the skylight. Sarah put on Elvis Presley, and we cupped 14 beautiful coffees in peace and calm. I really hope to do more stuff at CEL soon. It's such a great location and the folks at Visions are the greatest. At some point this weekend, I did have the Coffee of the Week. But this post is getting too long, and I have a coffee shop review I want to get to, too. So I'll post that a little later. The hint is the picture at the top of this page, if you know that man. Event Announcement: Pacamaras in Seattle! If you're like me, when Coffee Fest (or any other coffee get-together) ends, you always wish you could have cupped more coffees. Somehow the whole weekend goes by and, while you got to sit in some lectures and visit some booths, you never got a chance to really dig in there with your spoon and explore the latest crops. I am sitting on some absolutely stunning fresh-crop pacamaras and bourbons from El Salvador — micro-lots that aren't available anywhere else — but I had begun to despair of finding the right location for a cupping at such a late date. Lucky for me, I ran into Sarah Dooley of Visions Espresso the other day (what a great town Seattle is!) and she told me about the Coffee Enhancement Lounge that Visions has boldly created. It's a roaster-neutral site where specialty coffee people — roasters, equipment people, retailers, baristas — can come together in the name of exploring great coffee. Well, great coffee samples + great location + great coffee people = the cupping is ON! You are cordially invited to join us for a cupping of these fantastic coffees, including the famous and elusive El Salvador pacamara. It's this Sunday, September 27th, at 1 pm. That's late enough for you to sleep in after the latte art smackdown and still hit the show floor. And it's early enough for you to get out of town plenty early in the day. If you AREN'T EVEN GOING TO COFFEE FEST, you should still come to our cupping. It's going to be a beautiful Sunday in Seattle. The CEL at Visions is located a hop skip and a jump from the Convention Center, at 2737 1st Avenue South, just south of the intersection of 1st and Lander. Plenty of easy, safe street parking there. These coffees are not to be missed! And Visions' Coffee Enhancement Lounge is something you DEFINITELY want to check out! Please RSVP to Daniel Humphries at daniel@coffeescholars.com if you would like to come. I anticipate we will have a full house, so RSVP early to ensure your spot! Last Wednesday I held a cupping that included some pacamaras that I was raving about. My two favorites in the session, which was half-blind (I knew which coffees were pacamaras and which bourbons, but did not know the farms until I later looked at my cheat sheet), were both from Finca El Carmen in the San Vicente region of El Salvador. El Carmen is on a volcano called Volcán Chinchontepec (which, roughly translated from the Nahuatl tongue means "Mountain Shaped Like Breasts" and no, I am not making that up.). This is an absolutely beautiful place which I visited on my last trip to El Salvador in February. The producers at El Carmen are taking really remarkable care of their coffee. Pacamara in micro-lots like this is a relatively new endeavor for them. From the high profile that pacamaras are starting to get, you might get the impression that they represent a big proportion of the Salvadoran coffee export each year. But in reality, it's somewhere around 1%. Just one percent! But demand is sky-high, both in the States, and around the world. There's really nothing quite like a pacamara from El Salvador; and El Carmen is producing some of the very best. What is a pacamara? Well, it's a hybrid coffee plant. Just like a merlot grape yields different flavors than a cabarent franc grape, different coffee varietals give you different coffee flavors. Pacamara is a unique blend of two varietals. 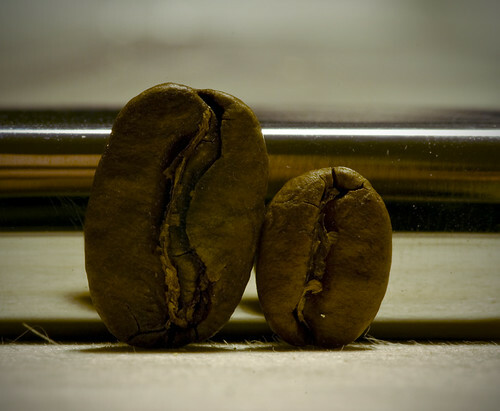 One half of pacamara is the pacas varietal, itself a mutation of the more widespread bourbon varietal. Pacas is un café muy El Salvador, named for a member of the well-known Pacas family of coffee people and sharing many of the characteristics of the sweet, luscious bourbon. The other half comes from the maragogype line, best known as the "elephant bean" coffee for it's huge leaves, fruit, and beans. Blend these two together and you get Pacas-Maragogype, or paca-mara. Pacamaras are true artisan coffees. They have strange, exotic, yet pleasing aromatics and tastes. They can also vary noticeably in size and shape. This makes them a challenge to roast, though well worth the effort. In the two El Carmen samples that wowed me last Wednesday, I noticed a perfect foundation of chocolatey sweetness and medium acidity. What made these two stand out for me, though, was an incredible buttery richness coupled with a strongly prevalent herbal characteristics. These coffees were like a really luscious, creamy, sinful dessert you might get at a French restaurant. If you have never tried it, there's really nothing like a great pacamara. So there you have it. Pacamara samples from Finca El Carmen. This week's Coffee of the Week!